Werner's Cairns blog: An interesting discussion about the pros and cons of fluoride removal filters. An interesting discussion about the pros and cons of fluoride removal filters. Since we have been denied our democratic right by the Bligh government, who mandated water fluoridation without giving the population a choice, fluoride removal filters have become the issue for people who don’t want drink this toxic poison from the aluminium and fertiliser industries. Following is an e-mail exchange between a number of people discussing the various filters in use. For people who have not yet decided on a filter system, this may be of interest to them. What Anna Bligh put in, people are desperate to take out. What a waste of money. The government makes a mockery of our National Anthem, which starts: “Australians all let us rejoice. For we are young and free; . . . . “ Unfortunately, we are not “rejoicing” nor are we “free” anymore. 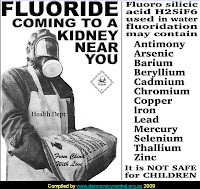 It is a shame that the Queenslanders who don’t want to drink this poison are forced to spend money to remove fluoride from their drinking water, when drinking tea, which contains large amounts of fluoride, or giving away free toothpaste with fluoride to families, would have been a cheaper option. This government has wasted over 40 Million dollars on the infrastructure to bring this poison into our homes. Click picture to enlarge! 1. Dr Mercola is a big advocate of reverse osmosis water over distilled because he feels that distilled water leads to nutritional deficiencies. I’ve never thought this since the rain that falls from the sky is distilled water. Of course the best water is after it’s fallen and run through a river etc. etc. So interesting comment below that people have lived ripe old ages drinking tank water. So tank water is distilled water that’s been sitting in a tank! Regardless, my take is do whichever feels right and is most convenient. Distilled water requires boiling which may not be suitable for a tropical environment. It’s like boiling the kettle for 4 hours – it generates a lot of heat. Reverse osmosis wastes a significant amount of water, which might work out quite costly for some. 2. Some people find reverse osmosis (RO) filtered water too acidic. According to Dr Joseph Mercola, RO filtered water can indeed be a bit acidic because the water absorbs carbon dioxide from the air, which converts to carbonic acid. Dr Mercola said this can be easily remedied by adding about half a teaspoon of a high quality salt - like Himalayan salt - in about one gallon of water. Click here, http://products.mercola.com/himalayan-salt/ for a video discussion about Himalayan salt between Dr Mercola and a natural health expert from Germany. In an article by Dr Mercola, he questions with good reason the safety of long-term ingestion of distilled water and believes 'an RO system likely removes the broadest spectrum of contaminants of any home filter system' and its the system he personally recommends to optimize the safety and purity of water. You can note in Caree's first dot point comment that, as she understands, it appears that all water that falls from the sky is also slightly acidic (like RO-filtered water) and it absorbs carbon dioxide and then forms carbonic acid, which Dr Mercola noted RO-filtered water does. A lot of people have lived to ripe old ages with good teeth on tank water! So why not on RO-filtered water? 3. Your comments on Reverse Osmosis filtered water and pH are kind of confusing. This is how I understand it: All water that falls from the sky is slightly acidic. It absorbs carbon dioxide on the way, forming carbonic acid. Water becomes alkalised via natural minerals and salts. Ocean water is alkaline. Tank water is notoriously acidic. Treated town water tends to be more alkaline due to the addition of lime. Reverse osmosis filtration removes minerals etc leaving the water more acidic. Distillation does the same thing. Acidic water is great on our skin and hair, but our insides require a pH of around 7.35 to 7.44 (blood pH). A quality Reverse Osmosis unit is multi-stage. It should first filter sediment, at around 5 microns, then pass into at least 2 more filter cartridges to remove water treatment chemicals, heavy metals etc and take the water to a neutral pH. Any system which does not do this will lower the efficiency of the RO membrane. After the RO membrane, another cartridge should be used to bring the water back to a healthier pH, (around 7.5). Some units even add an extra “alkalising” cartridge to bring the pH up to around 8. The quality of your RO unit will affect the acidity and quality of the filtered water it produces. Some of the really cheap units do not neutralise the water prior to reaching the RO membrane and this will reduce its ability to remove other impurities. Bicarb soda on its own can dilute gastric acid too much, but in combination with citric acid, will alkalise water as well – a little more bicarb than citric acid is ideal. 4. Reverse osmosis water made with low pressure membranes (the ones universally sold in under sink systems) contains at least 15-19 PPM dissolved solids therefore there is not the problem of CO2 absorption as for distilled water. This RO water as Ph 7 or more than 7. I put the RO water in a Durand pot (click on this link) and I put a little spoon of pharmaceutical grade calcium + magnesium citrate (I bought at Carina Night & Day Pharmacy) in ratio 6:1. Then I let the ceramic filter of the Durand pot slowly filters the water. The most of calcium and magnesium remains in the upper pot and only a few submicron particles pass to the lower pot but they are enough to alkalize the water very much. I also add very little zinc oxide which is very important for the immunity system and a couple of drops of iodine (Lugol’s Solution). This technique is also very powerful to absorb the residual fluorine ions because the most of them bind with calcium and magnesium, which sediment in the upper pot and do not pass through the ceramic filter. If someone wants to use this technique to improve the fluoride decontamination, Magnesium Citrate (very soluble) should be replaced by magnesium oxide powder, which is not water soluble and remains in the upper pot. 5. We have been using RO for years and then we add minerals that alkalise- this can be done with xooma which I used to use, which is coral calcium- its fairly expensive over the years. We now have a Nikkon water mineraliser- so once you have it just replace the ioniser yearly for about $120 – it does alkalise and add minerals- my Ayurveda consultant had one that was a filter and then over rocks- but the filter did not remove the fluoride. My son uses good salt as he drinks huge amounts due to his training and it seems to be working for him. My daughter started using the alkalised water and felt it really helped her skin- as she drinks far to much alcohol which acidifies her body and my hunch is her liver is not functioning how it should - 24 year olds! Pi Mag 15 litre water system $550 + GST. Of the four filters one needs replacing about every 6 months, one every year, one every two years and one every five years. They average about $53 each. Pi Mag 2 litre Aqua Pour Expres $494:40 + GST Two filters average about $35 each. Recommended for small areas e.g. caravan small kitchen etc.